How Does Bankruptcy Affect Credit Score? After emerging from a bankruptcy case, most people will swear they have no intention of getting into debt again. They certainly don't want to repeat mistakes or go through the trauma and the drama that often leads an individual to file the first time. Hopefully, for those who had to file in order to discharge burdensome credit card debt, they've learned better financial management through credit counseling and debtor education. Controlling spending and avoiding unnecessary credit card debt are certainly laudable goals. Still, even if you believe you won't need credit in the future, that may not be realistic. You might have broken the habit of charging a restaurant dinner or using your credit card to buy a new pair of shoes on impulse, but It's hard to save up money to buy a house or even a car. So, how does bankruptcy affect a credit score? It's a legitimate concern. Let's look at what happens when you file. One of the leading purveyors of the credit score is a company called Fair Isaac. Scores calculated using formulas and algorithms developed by the Fair Isaac Company are called FICO scores. Fair Isaac’s formula is proprietary, meaning that Fair Isaac owns the process and doesn’t have to provide that formula to anyone. Because of this, sometimes it is difficult to explain or predict how the company calculates any particular credit score. FICO credit scores range from as low as 300 to as high as 850. Most lending banks consider a credit score of 720 to be good. The Fair Isaac Company uses the information contained in your credit report as the raw material for calculating the score. The three main credit reporting agencies, Equifax, Trans Union and Experian, may not have the same information, and therefore, your credit score could differ from one agency to another. Usually, this difference is not more than a few points. For Fair Isaac to calculate a credit score at all, you must have at least one account that has been open six months or longer, and at least one account that has been reported to the credit bureau within the last six months. 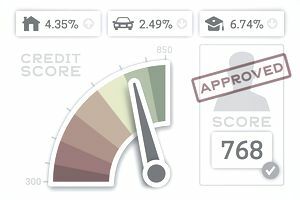 To learn more about what goes into determining your credit score, see How My FICO Scores Are Calculated. Other companies also market and provide credit scores based on their own calculations, which may differ from the ones used by Fair Isaac. Most types of negative information in your credit report will affect your credit score. If you are slow to pay or skip payments, your score will reflect that. Carrying a large amount of debt compared with the limit on those accounts can also be an issue. Before reaching the point where you file bankruptcy, you probably found it difficult to pay regularly on your accounts. You might have maxed out most or all of your credit cards. Either circumstance will negatively affect the credit score. It's difficult to predict exactly what your credit score will do after you get your bankruptcy discharge. How bad your credit score is when you file doesn't seem to have much affect on where you end up. If you start low, you'll come out of bankruptcy low. If you start high, your score will drop a lot. But most people report that they end up at about 550 as they come out of bankruptcy, regardless of whether they start out with a high score or a not-so-high score. The bottom line for many, however, is not the effect the bankruptcy will have on the credit score. It's the effect that filing bankruptcy will have on credit decisions in the future. Even without a credit score, the fact that bankruptcy appears on the credit report at all will drive many credit decisions for as long as the filing appears, which can be for as long as ten years. There is good news and hope for the future. Many people who file bankruptcy also report that if they're careful in their efforts to rebuild their credit, don't take on too much debt too soon, and scrupulously pay their debts on time every time, it takes about two years for their credit scores to rise into the "good" range. Next, learn why your credit score is important even after bankruptcy, and the steps you can take to improve your credit score.